I’m on a real roll with the food blogging right now. I just want to make sure I am caught up with my documentation before grad school classes start next week. I have been encouraged by friends and family to document my recipes, since I never really measure anything or cook from recipes. Everything just lives up in my head, but I want to start documenting things in order to help myself remember and to share with others. This is a dish I came up with in Tahoe last week. I think of it as French food done California casual style. 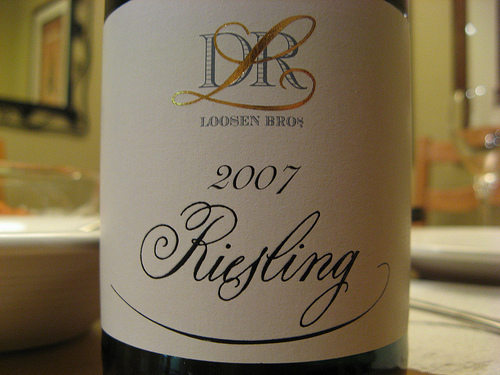 If you want to replicate it, find an off-dry riesling, with a good acidity and not too sweet, but still nice and fruity. You only need a little bit of the wine for cooking, the rest is for drinking with your meal! The sauce is my bastardization of the classic French beurre blanc, but I’m not that classy, so I’m not going to claim to call it that. This recipe will generously serve 2 people, with leftovers. In a small sauce pan, pour in about 1 cup of riesling and add 1 minced shallot. Bring to a boil, then reduce to a simmer and reduce until about 1/3 of the original volume. In the meantime, melt about 2 tablespoons of butter in another pan and sauteé the swiss chard ribbons with the garlic and the rest of the shallot. Add a splash of the riesling, season with sea salt and freshly ground black pepper. Reduce heat and braise until tender. Season the salmon filets well with sea salt and freshly ground black pepper. In yet another pan, melt more butter and sear the salmon on both sides until just barely pink. Remove from heat and set aside. The sauce and the chard should be about ready by now. Turn off the heat on both the chard and the reduced wine sauce. Whisk in about a half stick of butter, a pat or two at a time, into the reduced wine mixture. Add the dill, parsley and green onion/chives, and whisk again to combine. Plate the salmon with the chard and top with the dill sauce. Serve with the rest of the riesling and plenty of crusty French bread and lots of soft butter (if you dare). I had some leftover salmon and sauce, so I decided to make some pasta for lunch the next day. Flake the salmon with a fork, removing any skin and bones. Melt the leftover sauce with another splash of the wine and some more butter if necessary, throw in some chopped tomatoes and the salmon and just heat through. Cook up a pack of fresh spinach fettucine, drain and toss with the sauce and top with more fresh herbs (dill, parsley and chives). There you go, two meals in one.